For as long as I can remember, the CES mantra has been "smaller, cheaper, faster". Has someone mentored you toward achieving your career dreams? Nominate your Corporate Champion before March 4th to see them recognized at the National Conference! While we sometimes mutter about wanting to work for ourselves, most people, most of the time, really want to work for an organization. However, there is a large segment of the population that, for better or worse, needs to build their career outside an organization. These are the temps, independent contractors and free agents. If you are not already in one of those categories, someday you might be. What does the future hold for those who need to build their careers without organizations? Think about how many things your office schedules each day: appointments, meetings, rooms, staff, vacation time, special events, training classes, project deadlines, facilities, autos, equipment, the list goes on and on. 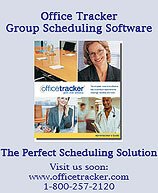 Now imagine the perfect scheduling solution. Office Tracker helps you and your entire company to make sure everyone's appointments are confirmed, meetings are well planned, your service staff knows where they are supposed to be and when, you know which rooms are being used and which ones are free. With Office Tracker you know what the rest of the office is up to - up to the minute, and when you're on top of things, you know you're going to have a great day. Why a home is the best investment a single woman can make. How even the credit-challenged can buy. How to maximize your ability to generate wealth via residential and investment income property. How to develop a wealthy & successful mindset. How to create and achieve both your personal and business financial goals. Powerful secrets to being a successful investor. Do you work too hard for not enough money? Do you dream of having more cash, less financial stress and a plan tailored for you to create financial freedom? Then this evening is perfect for you!! In St. Louis, the event will be at The University Club Tower (1034 S. Brentwood Blvd. / The Presidents Room - 22 Floor) from 5.30 to 7.30 pm on March 8, 2005. In Los Angeles, the event will be at Brookstreet Securites (9300 Wilshire Blvd., Ste. 420, Beverly Hills) from 6.00 to 8.30 pm on March 23, 2005. Intel would like to offer you an inside look at our company as a great place to work. As part of our dedication to diversity, we are proud to introduce Intel's Success Through Diversity Jobs at Intel Newsletter. The goal of this new monthly newsletter is to provide you with the information you need to better understand Intel's career opportunities, company culture, and employees'so you can find the job at Intel that's right for you. In addition to regular feature articles, employee profiles, job search tools, reminders and resources for finding a job at Intel each newsletter also has three different Success Through Diversity feature articles. You can sign up for one, two, or all three. ÊOur feature articles focus on different community groups at Intel such as: African Americans at Intel, Latinos at Intel and Women in Technology at Intel. Click here to sign up and receive Intel's Success Through Diversity Newsletter today. Under direction of the ITS System Group Manager, the selected candidate will be an integral member of the deployment of the campus enterprise systems and services. The selected candidate will specifically be involved in operational support, architectural development, project communication and education processes associated with campus enterprise systems. Preferred qualifications include experience with the installation and system tuning for Linux and Solaris environment; experience with enterprise level email system and directory services (LDAP) deployment and support; and experience with Apache, Twiki, Microsoft Project, Visio and Microsoft Office suite. Take A New Look at Getting Dressed!